Argentina's economy minister, Martin Lousteau, has resigned after less than five months on the job, officials say. He was behind a tax rise on soybean exports, which triggered a three-week strike by Argentine farmers that resulted in widespread food shortages. At 36, Mr Lousteau was the youngest member of President Cristina's Fernandez's cabinet. He also reportedly had run-ins with other ministers over inflation and the direction of the economy. Reports said that Mr Lousteau, whose resignation has not been officially announced, would be replaced by Carlos Fernandez, head of the country's tax agency. The farmers' strike led to food shortages in the country as farmers blocked trucks from delivering beef, chicken and produce. The farmers have threatened to erect new barricades if the government does not offer concessions on the tax hike. It was the biggest crisis faced by Ms Fernandez since she took office in December. 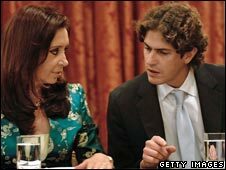 Mr Lousteau was one of few new faces in Ms Fernandez's cabinet, with most ministers retained from the administration of her husband, former President Nestor Kirchner. Why are wheat prices rising?